Test Valley Borough Council: Pure Town Planning are pleased to have secured retrospective consent for fascia signage at a shop in Andover town centre in Hampshire. As the sign was fixed to a listed building both advertisement consent and listed building consent were required – something our client had not realised before going ahead. 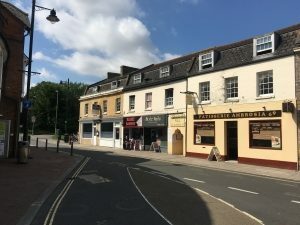 Pure Town Planning submitted the applications rapidly because of the threat of the Council taking further action (whilst it is relatively rare, in the case of unlawful adverts and unlawful works to a listed building the Council can launch a prosecution). In order to save our client time and cost we produced the necessary drawings ourselves. Pure Town Planning submitted a planning and heritage statement with the applications which successfully argued that the sign in question was entirely in keeping with the surrounding conservation area, did not harm the historic character of the listed building and in fact would represent a considerable appearance improvement compared to the sign which was replaced. The consents were granted well ahead of the eight-week target period and now our client has peace of mind again. If your Council has contacted you alleging that you have undertaken development or put up signs without the necessary consents then contact Pure Town Planning to take advantage of our free consultation to get some initial advice. We can assess whether the Council is indeed correct, let you know the consequences if the Council take further action and advise whether retrospective consent is likely to be achievable. If the Council are putting pressure on we can often lodge planning applications very quickly.